More kid's stuff, this time the score to an Indian children's movie. A rare thing, apparently. 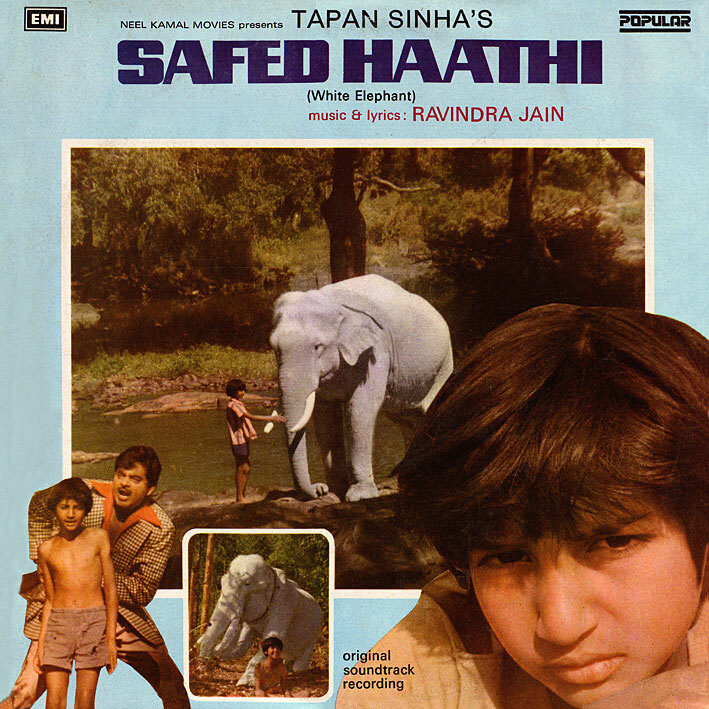 'Safed Haathi' is another LP I picked up (cheaply) out of curiosity more than anything; Ravindra Jain is a music director whose name I've come across quite often, but never previously been tempted to pursue. It's also one of those albums where they've thrown together the songs (and bits of songs), dialogue and background music into unseparated side-long tracks, suggesting it's intended as an abridged version of the film's story. As I find none of the songs particularly exciting, it leaves me, unproficient in Hindi as I am, somewhat cold. That said, I do quite enjoy 'Jangal Jangal Dolu Mai', at least while watching the colourful fairytale-like picturisation. Chipmunk-voiced creatures seem to be popular in any language. In order to facilitate listening I've split up the tracks. Nothing's been left out though. thank you for not stopping! if you ever want to do a radio show send me 2 hours of music and i'll play it on air. it's the least i can do. Lovely, lovely film, but not really many actual songs :) Look forward to the background/instrumentals from this though!